A selection of some of our most popular audiobooks for all ages. Which one will you listen to next? Take a listen to Andy Shepherd’s enchanting debut The Boy Who Grew Dragon’s, read by Ewan Goddard. This charming story, about a boy who finds a dragonfruit tree, is the perfect way to get children listening to audiobooks. It was recently longlisted for the Blue Peter Book Award 2018 and its sequel, The Boy Who Lived With Dragons, was published in September. Listen to the audio extract here. The Boy Who Grew Dragons is such an enchanting, joyful story. Above all it celebrates the magic in the everyday – you never know quite what you might find when digging at the bottom of the garden! 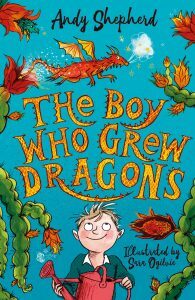 Tomas is lucky enough to find dragons… and so begins a wonderful adventure, which Ewan Goddard narrates with perfect playfulness and humour in this fantastic audio edition. 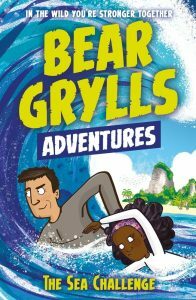 The fourth in the fun 12-book collectible series for young readers from survival expert and Chief Scout Bear Grylls. Each book follows a different child at an outdoor activity camp. Once they are given the magical compass, they meet the inspirational adventurer in an amazing place and learn new skills and facts they can take with them back to their real life. Volume 4 follows the story of Chloe who, when given a mysterious compass with a fifth direction, is transported to a tropical island beach and has to brave the extreme conditions with the help of survival expert Bear Grylls. It’s not like a typical trip to the seaside! Who doesn’t love Bear Grylls?! This series really is the gift that keeps on giving. It introduces children to a wealth of outdoor adventures and encourages them to explore and learn new skills. I think it probably teach adults a thing or two as well. The audiobooks are especially good for long car journeys to keep the whole family entertained! 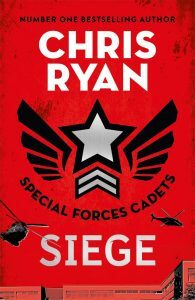 Listen to Chris Ryan’s first book in the exciting and action-packed Special Forces Cadets series. SIEGE, the beginning of a brand new series for teens and young adults has a cracking premise, laced with adrenalin. Featuring a storyline where teenagers are trained by government agencies to assist where adults would be deemed suspicious, the peril and drama run high. This all comes from the much-admired Chris Ryan, who draws on his SAS experience to give a genuine and thrilling reading and listening experience. 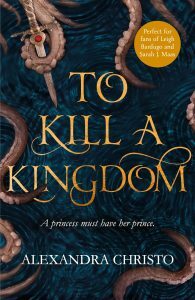 This dark and romantic YA fantasy is ideal for fans of Sarah J Maas – about a siren with a taste for royal blood and the prince who has sworn to destroy her. ‘I have a heart for every year I’ve been alive.’ Those are the opening words of To Kill A Kingdom and they send shivers down my spine each time I listen. Lira and Elian are such complex and morally ambiguous characters – and the narration of the audio edition brings that to life brilliantly. I am in awe of Joe Jameson who narrated this audiobook – and I’m not the only one. 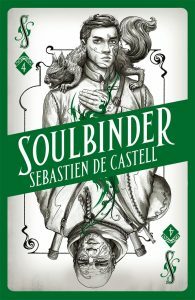 Sebastien se Castell has created an incredibly rich and captivating fantasy world for this Spellslinger series, and Joe doesn’t miss a beat in bringing it all to life. In fact, the series is a wonderful example of author and narrator working together; they’ve had some great conversations about all the characters and detail in the books. And it makes all the difference! “When women share their stories, loudly and clearly and honestly, things begin to change – for the better. 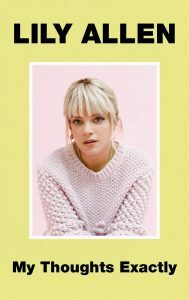 In her number one Sunday Times bestselling book, Lily Allen writes in her distinctive style with searing honesty about the highs and lows of her life. My Thoughts Exactly is a candid, utterly absorbing and compelling first book, dealing with fame, feminism, drugs, drink, co-dependency, relationships and so much more. The audiobook is narrated by Lily herself. I already knew Lily’s take on life would be an interesting listen, but I had no idea how moved I would be by the things she recounts in My Thoughts Exactly. It felt as though I was listening to Lily in a one-on-one session – being exposed to an incredibly vulnerable side of her, that you rarely see portrayed in the media. It’s changed the way I listen to her music, I’m much more sensitive to her lyrics now. Fifteen years ago, Gary Barlow, one of the most successful British musicians and songwriters of all time, hit rock bottom. He was out of shape, out of work and depressed. In this moving audiobook, which is shortlisted for Audiobook of the Year at the Specscavers National Book Awards 2018, Gary speaks of how he went from being an obese, out-of-work pop star to staging one of the most thrilling professional comebacks in decades. 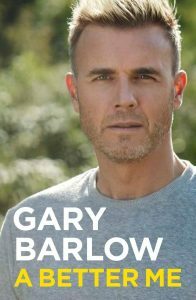 Gary is now a hugely successful superstar of music and TV, as well as an accomplished musical songwriter and producer – he’s full of vitality, fitter, happier and more successful than ever before. A Better Me is a remarkably frank account of Gary’s journey. In his warm, witty and authentic voice, he recounts his story with compelling insight, captivating sincerity and a human side that people rarely see. I was left speechless by Gary’s performance. He has poured his soul into this audiobook; it’s full of character, cheeky humour, and heartbreaking emotion. His story and voice utterly compels the listener! The groundbreaking thriller from the Queen of Crime Drama and now a major motion picture, directed by Steve McQueen, Widows is a fast-paced heist thriller with an all female cast you won’t forget. Adding to the gripping drama in this audiobook is the voice of Ann Mitchell, the original Dolly Rawlings from the 1980s TV series. 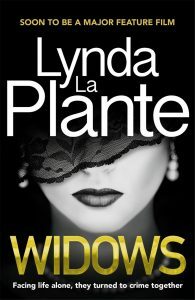 If you like nail-biting crime novels, there is nothing better than Lynda La Plante’s brilliant first novel, Widows. Now a major feature film directed by award-winning Steve McQueen and with the audiobook read by Ann Mitchell, the original Dolly Rawlins. Prepare to be swept off your feet by this enchanting reading of Strictly Come Dancing star Anton du Beke’s romantic and irresistible debut. 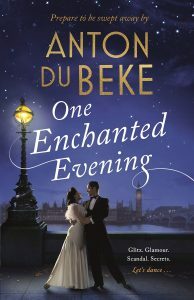 As a huge fan of Strictly Anton du Beke’s novel is everything I love: glitz, glamour, romance, dance and a cast of characters who you really root for, not to mention a sprinkling of scandal and secrets. Julian Ovenden brings all the wit, charm and style that Anton is famous for to this audiobook. “Such a brave story… Narrated brilliantly. I will 100% recommend this to friends and family.” This Audible review says it all. 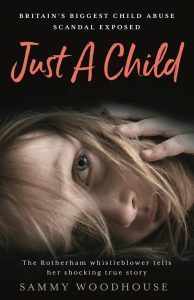 It’s not easy to cast such a personal, harrowing book, but Katy Sobey’s narration manages to be both sympathetic and gritty, capturing the power of Sammy Woodhouse’s story. Tweet us @bonnierbooks_uk if you listen to any of our audiobook suggestions! Jon Watt, Head of Audio, Bonnier Books UK will be speaking at The Bookseller’s FutureBook conference on Friday 30th November. Watt will be talking about our experiences launching our first in-house six-part podcast, The Barcelona Legacy, to promote Jonathan Wilson’s book of the same name.